Nine months before it seeks re-election, the government has begun directly charging households for water use. It is the latest piece of a seven-year, 30 billion euro austerity drive, but also the measure that has brought the largest public backlash. Saturday’s mass protest was the fourth since October. “This government believes that the anti-water charges campaign is dying, that we are on our last legs. Well, today we have sent them a message,” said Lynn Boylan, a member of the European Parliament for Sinn Fein. Sinn Fein said it had warned the government that Irish Water [Uisce Eireann] was nothing more than a ‘toxic quango’. A new ad campaign this month cost 650,000 euro, while 85 million euro has already been frittered away on private consultants. According to campaigners, not one leaky pipe has yet been fixed by the new company. Irish Water this week confirmed that it plans to send out the water bills to more than 1.7 million households -- in the knowledge that hundreds of thousands of those bills will be incorrect. More than 700,000 households who are not registered will receive a bill. Bills will also be issued to households which have undrinkable water, including those who have to boil their water. And up to 150,000 rural properties with a private water well and septic tank for sewage, who cannot be customers, will also be billed by Irish Water. Speaking in the Dublin parliament, Mr Adams said the absurd is now being presented as a form of government in Ireland. “All these citizens will receive bills for a service they do not receive and you are now threatening to deduct these bills from their wages, pensions or social welfare payments. As the bills are getting printed up, a new scandal is brewing over the manner in which Irish billionaire and Fine Gael backer Denis O’Brien came to control the firm which is responsible for the water meter installation program. Siteserv, which later evolved to become GMC Sierra, was sold by the state-owned ‘bad bank’ to a company controlled by O’Brien for 45 million euro, with a 100 million euro of debt ‘written off’ in the process. It has now emerged a rival company made a higher bid for the firm, but was declared the “underbidder” in the “managed” transaction. It was also revealed this week that there are no records or minutes available of important meetings that were held in 2012 between former Minister Phil Hogan and key players in Irish Water. This is despite the fact that then Environment Minister was spending 180m euro of taxpayers’ money and a whole host of serious decisions, such as the metering programme, were being discussed. Sinn Fein leader Gerry Adams called for a parliamentary inquiry. “In light of the scandal around the huge sums of public money spent on consultants this is an extraordinary revelation,” he said. Meanwhile, the legality of new government proposals to deduct water bills directly from wages and welfare payments is also being questioned. 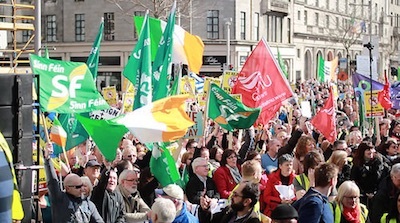 The move to allow Irish Water -- a stand-alone, commercial semi-state body -- to expropriate income could also open the way for other semi-state bodies to do the same. Socialist TD Paul Murphy said this week the new Environment Minister Alan Kelly had been “swaggering around like Nelson from the Simpsons threatening to rob people’s lunch money”. Mr Murphy said people deserved clarity regarding water charges, “not more waffle”. Pressure has fallen on the Labour leader and Minister for Social Protection Joan Burton, who was unable to say this week if she supported the garnishing of the water tax from people’s wages or social welfare payments. Her party also this week launched a bizarre and inexplicable broadside against the state-run broadcaster, RTE. The national radio and television service was accused of acting as a “recruitment sergeant” for the opposition parties by former minister for communications Pat Rabbitte, with Burton’s blessing. Sinn Fein deputy leader Mary Lou McDonald described Rabbitte’s comments as “bizarre”. “To say that RTE have been biased in their coverage of a matter of such enormous public interest smacks of desperation from a government that is clearly rattled by the huge turnout at the water protests and now seeks to stifle media coverage,” she said.